Sanday, North Ronaldsay, Papa Westray - Orkney Islands, Scotland. I loaded the drawing machine while we were grounded in Sanday's Otters Wick bay. Housed in its rope case and tied down to the cabins roof I suspect there will be more movement at this position on the boat. The tide was beginning to return, but the water was less than a foot deep as I looked overboard. A number of crabs were crawling across the sandy bottom searching for breakfast and the returning tide created a consistent small swell which rolled by towards land. Selkie began to float at around 8:45 and at 10:00 we hoisted the anchor and were off. Traveling out of the bay by iron sail we held a bearing of 24. North Ronaldsay was due North of us. It was a beautiful clear day with sunshine. 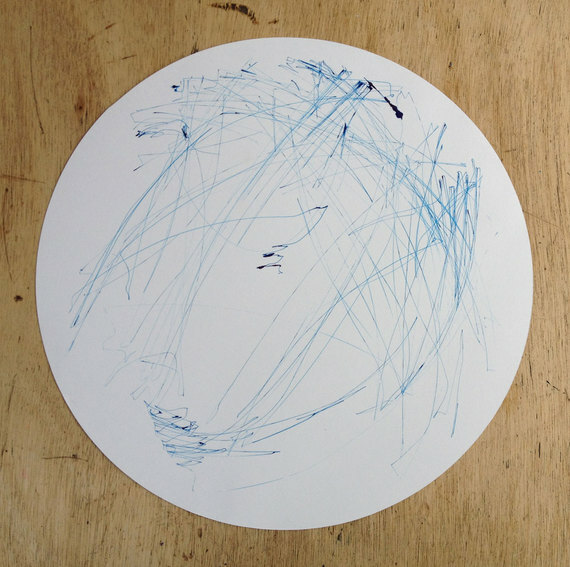 The drawing machine slowly worked marking our movements and responding to the sea. Reaching North Ronaldsay we dropped anchor just off the southern coast nearest to the North Ronaldsay Lighthouse and the Old Beacon. Traveling by dingy to an old boat ramp we went ashore to explore the island and visit the lighthouse. North Ronaldsay's largest population is that of the sheep the island is known for. Sheep have lived on this island for more than 5000 years and have evolved their diet only eat seaweed unless they are lambing. They are goat like in appearance and their coats produce very fine wool. All the of the sheep on the island are descendants of the original Orkney sheep presumed to have been brought to the island by Neolithic people and have survived on the island far longer than any humans. The lighthouse is the tallest in the British Isles standing at 109ft high was built in 1854 to replace the Dennis Head Old Beacon, which is made entirely of stone and dates to 1788. After a tour of the lighthouse, a blast of the foghorn and exploring this side of the island we returned to the ship. Selkie was bobbing about in the water while the drawing machine was drawing lines to and fro charting our motion and responding to each large swell. After hoisting the anchor we were off, our destination was the island of Papa Westray that is due East of North Ronaldsay. We raised our mainsail and shortly after our genoa and we rode the wind at a bearing of 260°. As we approached land and Papa Westray's Moclett Bay we were greeted by several small pods of Harbor Porpoises. I documented the last nautical mile of the trip in a video with a fixed sight on the anchor. The sun was low in the sky and its light was golden on the waters surface. As we sailed into the bay the seas floor could be seen with great clarity. The sandy bottom was only interrupted by seaweed, however sparsely. I dropped the anchor on the Captains call and soon we were still.